A nebula is an interstellar cloud of dust, hydrogen, heliumand other ionized gases. Originally, nebula was a name for any diffuse astronomical object, including galaxies beyond the Milky Way. The Andromeda Galaxy, for instance, was referred to as the Andromeda Nebula (and spiral galaxies in general as “spiral nebulae”) before the true nature of galaxies was confirmed in the early 20th century by Vesto Slipher, Edwin Hubble and others. 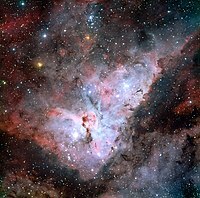 Nebulae are often star-forming regions, such as in the Eagle Nebula. This nebula is depicted in one of NASA’s most famous images, the “Pillars of Creation”. In these regions the formations of gas, dust, and other materials “clump” together to form larger masses, which attract further matter, and eventually will become massive enough to form stars. The remaining materials are then believed to form planets, and other planetary system objects. 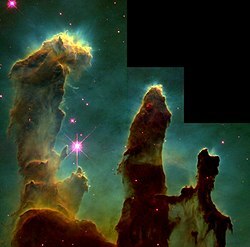 The “Pillars of Creation” from the Eagle Nebula. Evidence from the Spitzer Telescope suggests that the pillars may already have been destroyed by a supernova explosion, but the light showing us the destruction will not reach the Earth for another millennium. Around 150 AD, Claudius Ptolemaeus (Ptolemy) recorded, in books VII-VIII of his Almagest, five stars that appeared nebulous. He also noted a region of nebulosity between the constellations Ursa Major and Leo that was not associated with any star. The first true nebula, as distinct from a star cluster, was mentioned by the Persian/Muslim astronomer, Abd al-Rahman al-Sufi, in his Book of Fixed Stars (964). He noted “a little cloud” where the Andromeda Galaxy is located. He also cataloged the Omicron Velorumstar cluster as a “nebulous star” and other nebulous objects, such as Brocchi’s Cluster. The supernova that created the Crab Nebula, the SN 1054, was observed by Arabic and Chinese astronomers in 1054. On November 26, 1610, Nicolas-Claude Fabri de Peiresc discovered the Orion Nebula using a telescope. This nebula was also observed by Johann Baptist Cysat in 1618. However, the first detailed study of the Orion Nebula wouldn’t be performed until 1659 byChristiaan Huygens, who also believed himself to be the first person to discover this nebulosity. In 1715, Edmund Halley published a list of six nebulae. This number steadily increased during the century, with Jean-Philippe de Cheseaux compiling a list of 20 (including eight not previously known) in 1746. From 1751–53, Nicolas Louis de Lacaille cataloged 42 nebulae from the Cape of Good Hope, with most of them being previously unknown. Charles Messier then compiled a catalog of 103 “nebulae” (now called Messier objects, which included what are now known to be galaxies) by 1781; his interest was detectingcomets, and these were objects that might be mistaken for them, wasting time. The number of nebulae was then greatly expanded by the efforts of William Herschel and his sister Caroline Herschel. TheirCatalogue of One Thousand New Nebulae and Clusters of Stars was published in 1786. A second catalog of a thousand was published in 1789 and the third and final catalog of 510 appeared in 1802. 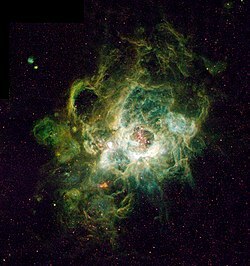 During much of their work, William Herschel believed that these nebulae were merely unresolved clusters of stars. In 1790, however, he discovered a star surrounded by nebulosity and concluded that this was a true nebulosity, rather than a more distant cluster. Beginning in 1864, William Huggins examined the spectra of about 70 nebulae. He found that roughly a third of them had theabsorption spectra of a gas. The rest showed a continuous spectrum and thus were thought to consist of a mass of stars. A third category was added in 1912 when Vesto Slipher showed that the spectrum of the nebula that surrounded the star Meropematched the spectra of the Pleiades open cluster. Thus the nebula radiates by reflected star light. In about 1922, following the Great Debate, it had become clear that many “nebulae” were in fact galaxies far from our own. Slipher and Edwin Hubble continued to collect the spectra from many diffuse nebulae, finding 29 that showed emission spectra and 33 had the continuous spectra of star light. In 1922, Hubble announced that nearly all nebulae are associated with stars, and their illumination comes from star light. He also discovered that the emission spectrum nebulae are nearly always associated with stars having spectral classifications of B1 or hotter (including all O-type main sequence stars), while nebulae with continuous spectra appear with cooler stars. Both Hubble and Henry Norris Russell concluded that the nebulae surrounding the hotter stars are transformed in some manner. Many nebulae or stars form from the gravitational collapse of gas in the interstellar mediumor ISM. As the material collapses under its own weight, massive stars may form in the center, and their ultraviolet radiation ionizes the surrounding gas, making it visible at optical wavelengths. Examples of these types of nebulae are the Rosette Nebula and thePelican Nebula. The size of these nebulae, known as HII regions, varies depending on the size of the original cloud of gas. New stars are formed in the nebulae. The formed stars are sometimes known as a young, loose cluster. Some nebulae are formed as the result of supernova explosions, the death throes of massive, short-lived stars. The materials thrown off from the supernova explosion are ionized by the energy and the compact object that it can produce. 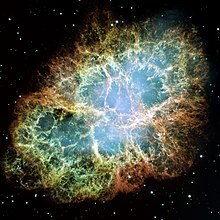 One of the best examples of this is the Crab Nebula, in Taurus. The supernova event was recorded in the year 1054 and is labelled SN 1054. The compact object that was created after the explosion lies in the center of the Crab Nebula and is a neutron star. Other nebulae may form as planetary nebulae. This is the final stage of a low-mass star’s life, like Earth’s Sun. Stars with a mass up to 8–10 solar masses evolve into red giants and slowly lose their outer layers during pulsations in their atmospheres. When a star has lost enough material, its temperature increases and the ultraviolet radiation it emits can ionize the surrounding nebula that it has thrown off. The nebula is almost 97% hydrogen and 3% helium, plus trace amounts of other elements. Herbig-Haro objects HH 161 and HH 164. The Horsehead Nebula, an example of a dark nebula. The Cat’s Eye Nebula, an example of a planetary nebula. The Red Rectangle Nebula, an example of aprotoplanetary nebula. Objects named nebulae belong to four major groups. Before their nature was understood, galaxies (“spiral nebulae”) and star clusters too distant to be resolved as stars were also classified as nebulae, but no longer are. Not all cloud-like structures are named nebulae; Herbig–Haro objects are an example. Close-up view of the diffuse nebula NGC 6357. Most nebulae can be described as diffuse nebulae, which means that they are extended and contain no well-defined boundaries. In visible light these nebulae may be divided into emissionand reflection nebulae. Emission nebulae emit spectral line radiation from ionized gas (mostly ionized hydrogen); they are often called HII regions (the term “HII” is used in professional astronomy to refer to ionized hydrogen). Reflection nebulae themselves do not emit significant amounts of visible light, but are near stars and reflect light from them. Similar nebulae not illuminated by stars do not exhibit visible radiation, but may be detected as opaque clouds blocking light from luminous objects behind them; they are called “dark nebulae”. Although these nebulae have different visibility at optical wavelengths, they are all bright sources of infrared emission, chiefly from dust within the nebulae. Planetary nebulae form from the gaseous shells that are ejected from low-mass asymptotic giant branch stars when they transform into white dwarfs. They are emission nebulae with spectra similar to those of emission nebulae found in star formation regions. Technically they are HII regions, because most hydrogen will be ionized, but they are denser and more compact than the nebulae in star formation regions. Planetary nebulae were given their name by the first astronomical observers who became able to distinguish them from planets, who tended to confuse them with planets, of more interest to them. Our Sun is expected to spawn a planetary nebula about 12 billion years after its formation. A protoplanetary nebula (PPN) is an astronomical object which is at the short-lived episode during a star’s rapid stellar evolution between the late asymptotic giant branch (LAGB) phase and the following planetary nebula (PN) phase. During the AGB phase, the star undergoes mass loss, emitting a circumstellar shell of hydrogen gas. When this phase comes to an end, the star enters the PPN phase. The PPN is energized by the central star, causing it to emit strong infrared radiation and become a reflection nebula. Collaminated stellar winds from the central star shape and shock the shell into an axially symmetric form, while producing a fast moving molecular wind. The exact point when a PPN becomes a planetary nebula (PN) is defined by the temperature of the central star. The PPN phase continues until the central star reaches a temperature of 30,000 K, after which is it hot enough to ionize the surrounding gas. The Crab Nebula, an example of asupernova remnant. A supernova occurs when a high-mass star reaches the end of its life. When nuclear fusion in the core of the star stops, the star collapses. The gas falling inward either rebounds or gets so strongly heated that it expands outwards from the core, thus causing the star to explode. The expanding shell of gas forms a supernova remnant, a special diffuse nebula. Although much of the optical and X-ray emission from supernova remnants originates from ionized gas, a great amount of the radio emission is a form of non-thermal emission called synchrotron emission. This emission originates from high-velocity electrons oscillating within magnetic fields.